Namibia and Guinea Bissau share spoils to remain top. 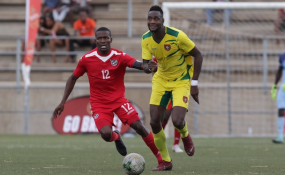 NFA — The Brave Warriors and Guinea Bissau played to a thrilling goalless draw at the Sam Nujoma Sadium in Windhoek in their 2019 African Cup of Nations (AFCON) finals qualifiers to remain top of Group K on eight points each. "We will take the point and look at the last game to make sure we qualify. We are disappointed with the result today after so many chances, football had other ideas. We did not know we could have so many chances and we should credit the boys. We still have a chance to qualify", said Mannetti. "Namibia is a good team and they showed in the first match we won last year and we came here prepared. We wait for Mozambique and we must win, final game, anything is possible", stated coach Baciro Cande.